The Customize Windows > Computer and Internet > General > What is WebSocket Protocol? WebSocket protocol is a TCP-based network protocol designed to be a two-way link between a web application and a web server in client server model. We have talked about the Protocols related to Internet of Things, this Protocol; standardized by the IETF as RFC 6455 in 2011 and as WebSocket API in Web IDL by W3C, can be a part of IoT related protocols. Normally, we can use WebSocket Protocol for live graphs, as an example. In a pure HTTP connection every action of the server requires a previous request from the client, it is enough for WebSocket protocol when the client opens the connection. The server can then use this open connection actively and can deliver new information to the client without waiting for a new connection from the client. A server-initiated transmission is in a pure HTTP connection only by delayed responses to a client-initiated request (long polling). Technically in WebSocket, like HTTP, the client sends a request with the difference that after the transfer of the data to connect the underlying TCP connection remains open and allows transfers in both directions. A secure version of the WebSocket protocol is implemented in Firefox, Safari, Google Chrome, Opera and Internet Explorer 10, mobile version of Safari and BlackBerry Browser. The intro­duc­tion of WebSock­et makes it possible for web apps to han­dle near real-time data with­out resort­ing to long-polling. Tagged With websocket protocol , web socket protocol , what is the websocket protocol , what is a websocket , what is websocket protocol , websocket protocal , websocket protocol computing , web api websocket , what is the web socket protocol , what is WebSocket Protocol ? This Article Has Been Shared 1001 Times! 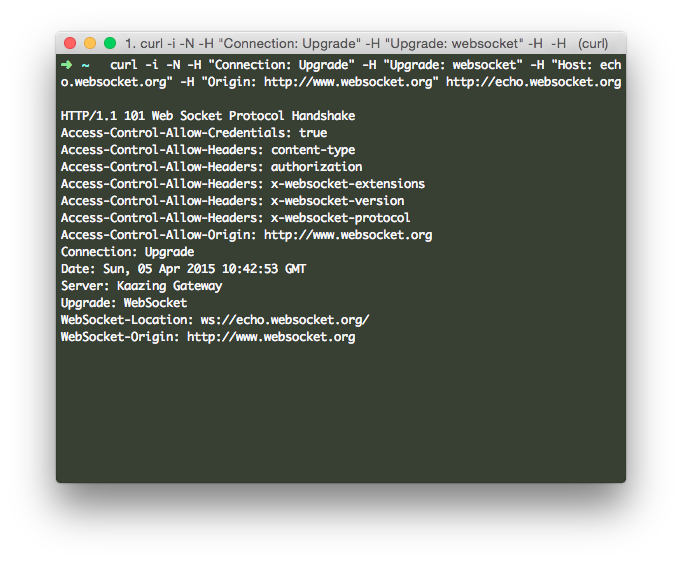 Articles Related to What is WebSocket Protocol? Windows Like Linux distro is most often searched by Power users to switch from Windows OS to Linux OS. Zorin OS is a Powerful Linux distro with Windows look. SaaS or Software as a Service is designed by the architecture to be used by the consumer. SaaS is the model oCloud which the general users mostly know to exist. Installing Git or doing SSH on a shared hosting account is simple and in most cases go without documentation. Here is some words on $PATH. In UNIX, Unix like operating systems including Linux, the shell of the OS have a mechanism called pipe or pipeline which looks like this |. We can password protect gzip Files on command line, like from SSH to remote server with gpg or openssl, to ensure more security of the file. Title: What is WebSocket Protocol? Cite this article as: Abhishek Ghosh, "What is WebSocket Protocol?," in The Customize Windows, April 5, 2015, April 21, 2019, https://thecustomizewindows.com/2015/04/what-is-websocket-protocol/.